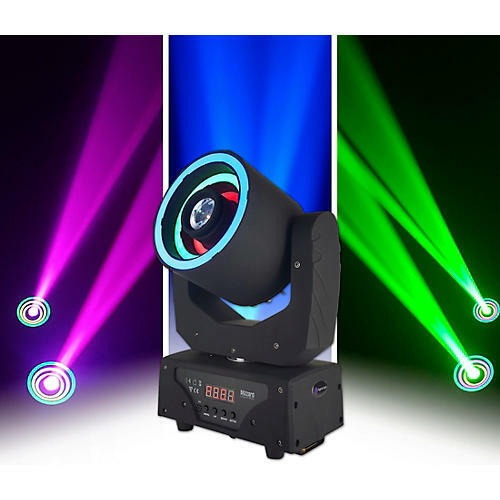 Transfix your audience with this unique moving-head spotlight that features three RGB SMD LEDs rings surrounding a high-output 30W white LED with a 4.7° beam and a 9-filter color wheel. With nine gobos on hand (plus open), the dynamic and powerful Hypno Spot is not your ordinary spotlight. The Hypno Spot produces mesmerizing chase effects, single LED chases, full color changes, and strobe. Hypno Spot offers two user-selectable DMX modes (12/23-channels) and an easy-to-use 4-button LED control panel. The power connections are industry standard powerCON compatible In/Out, and it is also equipped with 3-pin DMX In/Out jacks and a quarter-turn “Omega” quick connect type clamp bracket.